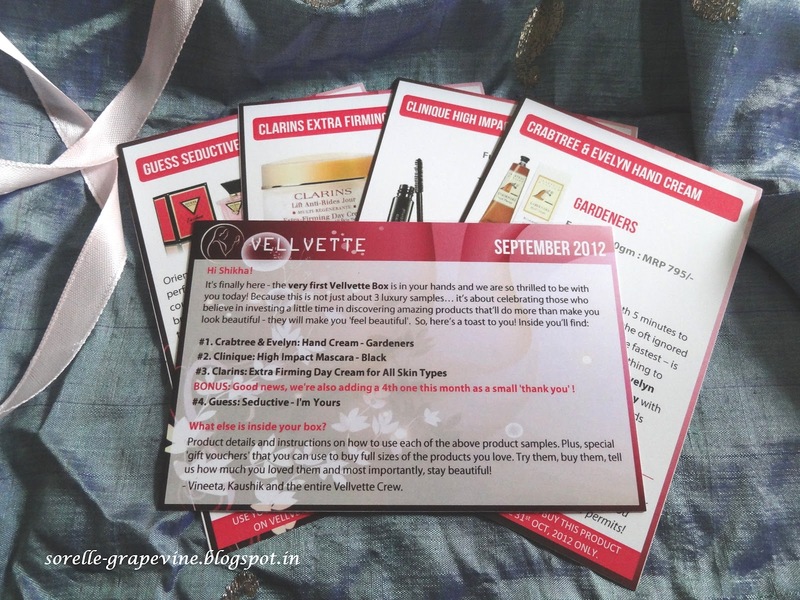 Sorelle GrapevineThe Vellvette Box - My first box! 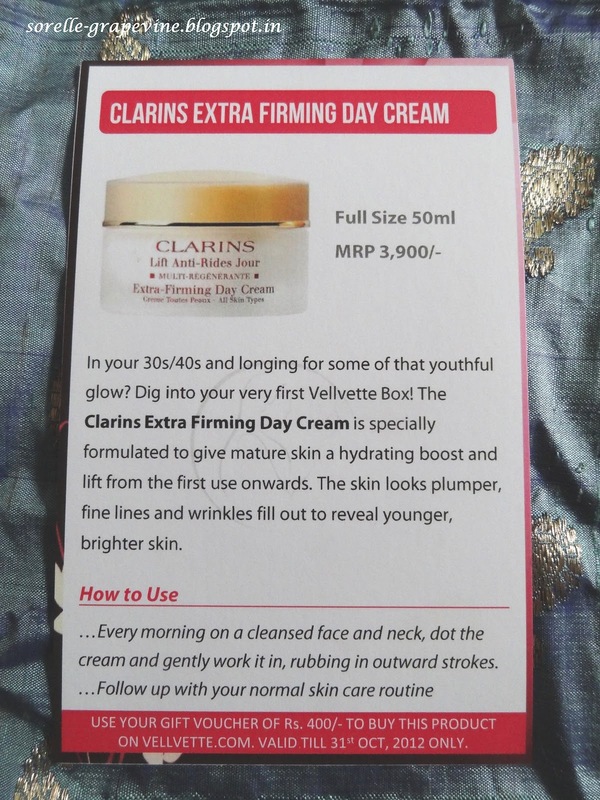 The Vellvette Box – My first box! Last week while browsing through my FB wall I came upon this ad for a beauty/birch box. I thought it was for something that would be available abroad as all the birch boxes of India have disappeared from the scene without a trace. But to my surprise the price was listed in INR. As usual I jumped on it. For me Blisscovered left a big gaping hole when it decided to quit its operations after a mere 3 months. 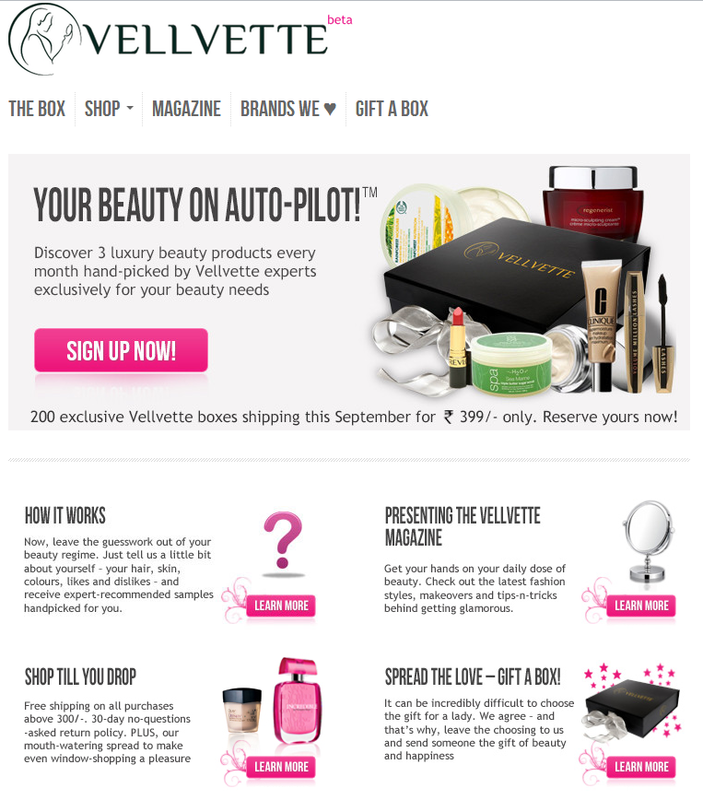 Well now enters The Vellvette Box. I just hope that they are around for a while coz this is such a boon for beauty bloggers plus not to mention exciting as one gets to try out new stuff without having to dish out oodles of money. The packing is cute and compact. It is a black cardboard box with gold lettering (classic) tied off with a pink bow (awww). 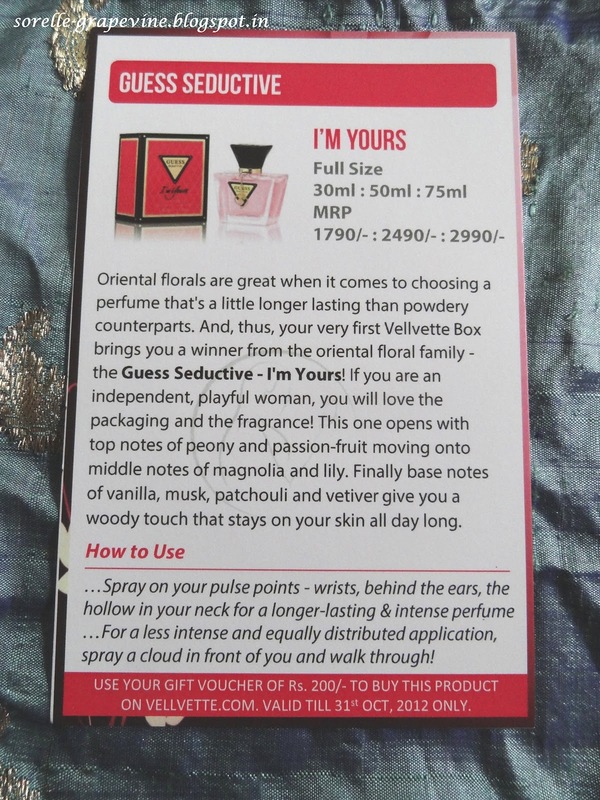 Inside it was a welcome note, individual product description cards, coupon cards and 4 (yes you read it right – 4 samples, they sent in a bonus one) deluxe product samples. They came wrapped in pink papery plastic. 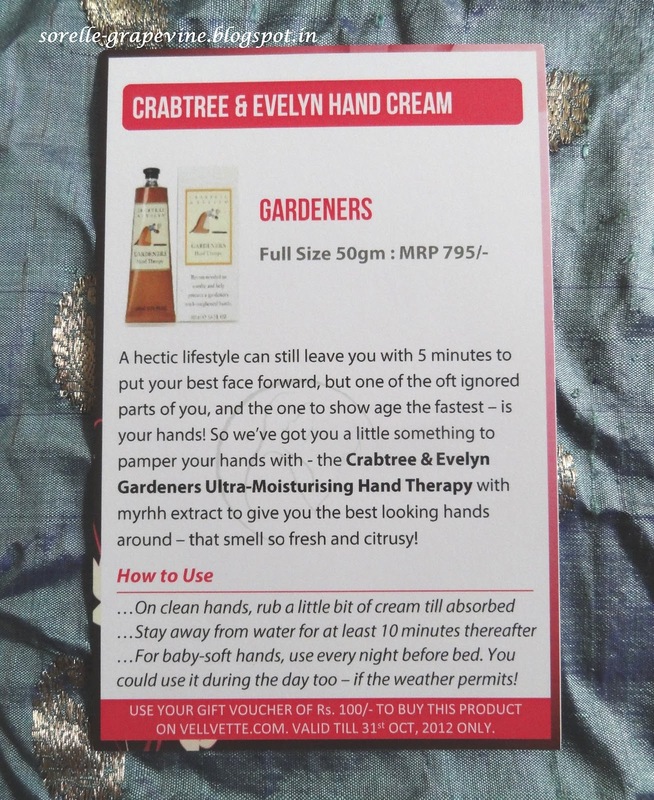 If you look at it, the Crabtree sample is 25g whereas the full size product is 50g which retails for Rs. 795/- so not bad at all that I dished out Rs. 399/- in all. 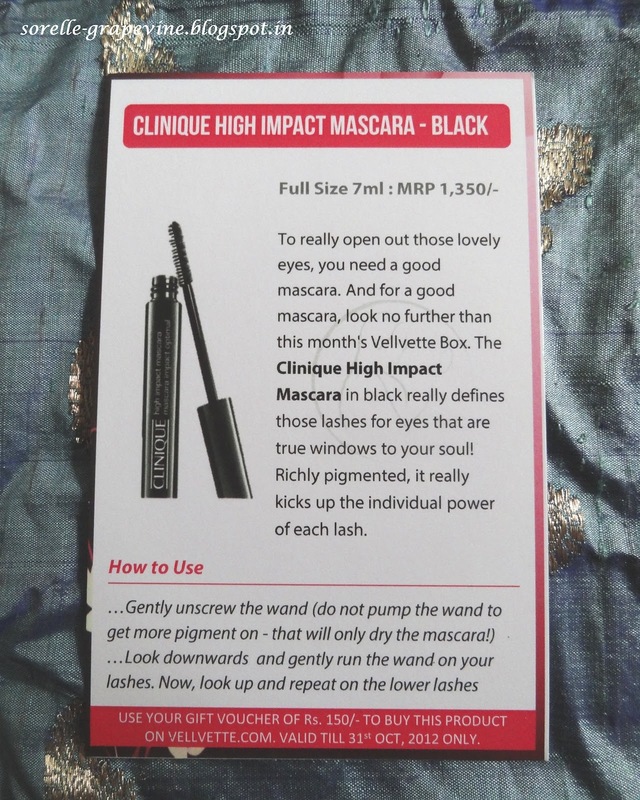 The mascara is about 2-3 inches (actually 2 inches for the product containing tube and 3.5 inches in total) containing 3.5 ml of product which is a good amount. 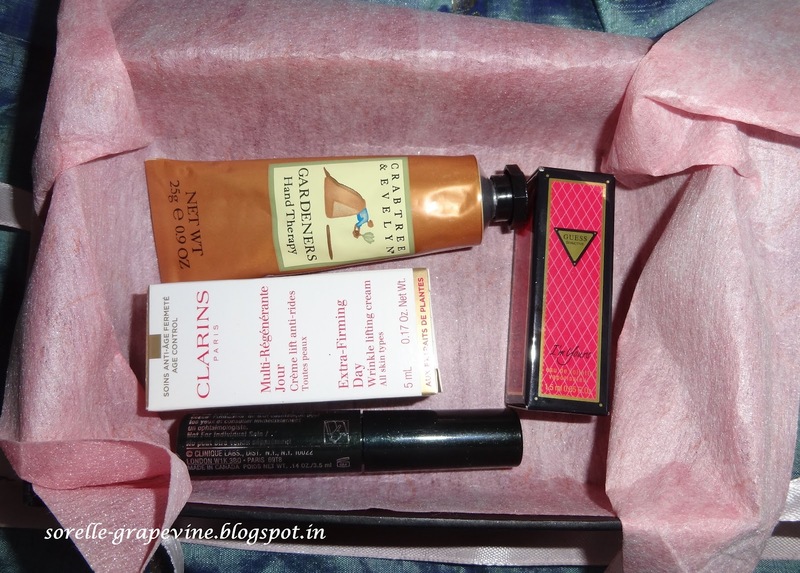 Clarins and Guess samples are about the size that you can pick up from the cosmetic counter. All in all a really good and impressive box. So divas, intrigued yet?!? I will definitely be purchasing from them again. Cant wait to see what they will have on offer next month. 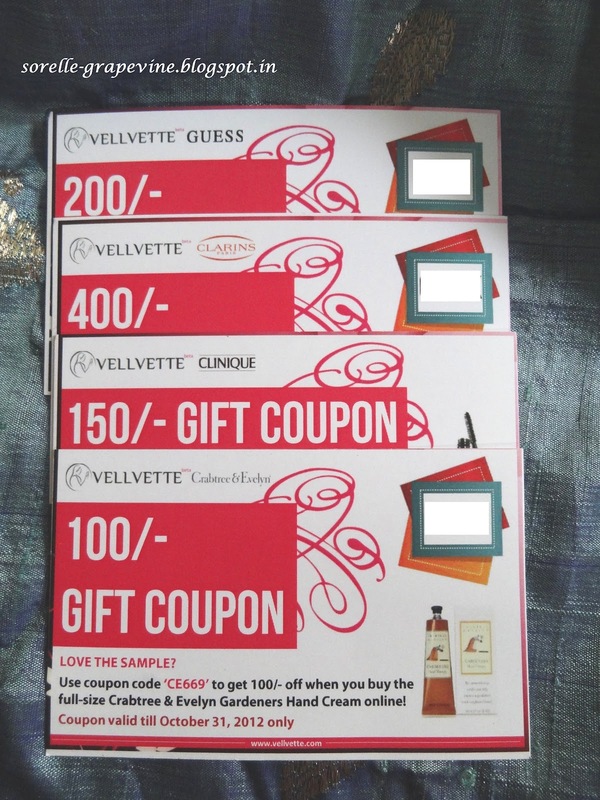 If you are interested then go to the following site to place your order – http://www.vellvette.com. Oh ya I forgot to mention, you can purchase the full sized products from their site at a discounted price. These mentioned products are available along with many others. 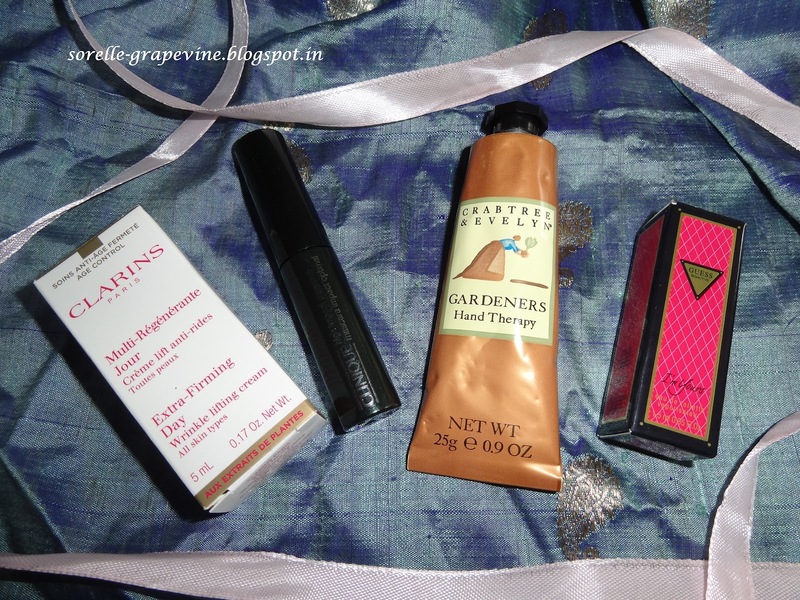 And keep watching this space for detailed reviews of the products mentioned in this post. Until next time – Ciao! Would you recommend it to your friend? – Most definitely! Fashion Enabler Series: Bikini Sari – Say What?! ?